Routinely monitor the long-term performance of the lab within minutes. All instruments using ASTM 1381/1394 protocols and most other instruments using proprietary protocols. Click here for a list of supported interfaces. If your instrument is not listed, we will provide the interface free. All you need are a serial-to-ethernet converter (not even that if your device is TCP/IP-ready) and a router. Simply connect one end of the converter to the device and the other end to the router and we do the rest! We establish your instrument and LIS/EMR connections and manage your databases in the cloud. Using the cloud lets you eliminate capital equipment and maintenance costs. You don’t have to worry about equipment failure; the cloud is always on and more disaster-proof than your own hardware. The cloud is also scalable so that it grows with your business. Using internet security protocols, your data transfer and storage can be as secure as you need them to be. All-in-all a cost-effective and virtually maintenance-free connectivity solution. LTP automated BAL fluids and PCF fluids run on ADVIA 120/2120™ hematology analyzers much faster and cheaper than by manual methods. For example: automated counts are obtained for a 64-sample study within 45 minutes of running the first sample, and do not require sample preparation or microscopy. By contrast; hemacytometry/cytospin/microscopy takes more than 15 minutes per sample and requires skilled technicians. Our software can be used for mouse, rat, guinea pig, and cynomolgus monkey BAL samples. For rats and mice, smoke inhalation models are available in addition to asthma models. PCF analysis is available for mouse samples. 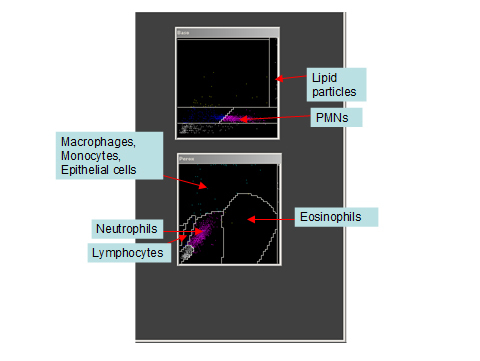 LTP BAL analysis products are used by most of “Big Pharma”. LTP has provided numerous benefits to our laboratory operation - higher quality results due to the improved lab-to-lab and Tech-to-Tech consistency in our reporting, a tangible improvement in the efficiency of the laboratory personnel interacting with LTP, and a big step towards going Green as we are printing far fewer instrument reports. We have been using the rat broncho-alveolar software and the mouse peritoneal software with the Advia 120 for many years. These have been reliable and very efficient tools for the rapid screening of our inhalation studies on our models of chronic obstructive pulmonary disease and asthma, and the evaluation of our models of peritoneal inflammation. The support from LTP has been tremendous and very important for the development of these assays within our lab.